You never know when some modern ribbon vectors will come in handy. 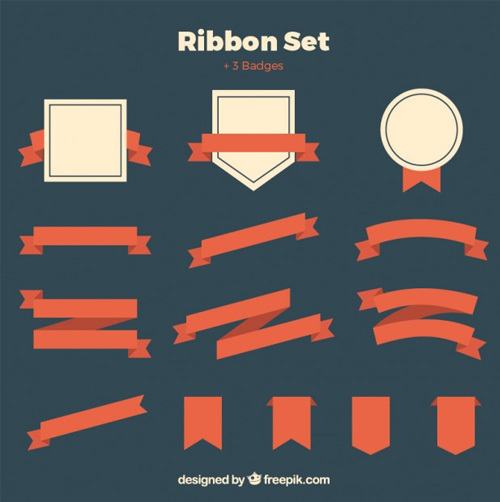 That is why we created this large modern ribbon vector freebies roundup you can easily download. 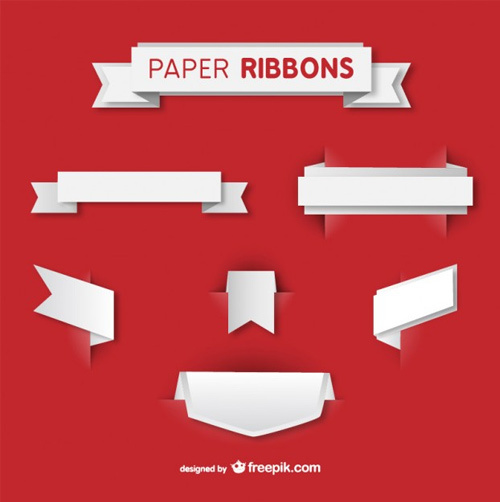 Whether you want flat, 3D, patterned or simple ribbon vector freebies, we’ve got you covered! 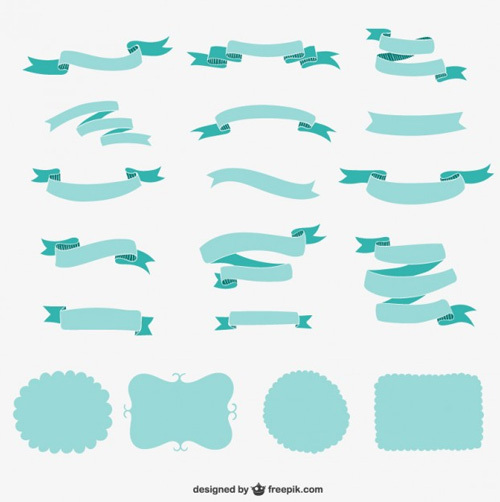 Here you’ll find all the ribbon vector freebies you need. You can use them for both web and graphic design projects, as buttons, icons, menus and more. They are very versatile and can be easily customized to fit your own custom color palette. Here they are – use them wisely! Do you need more similar vectors? Check out these free retro badges and free vector banners! 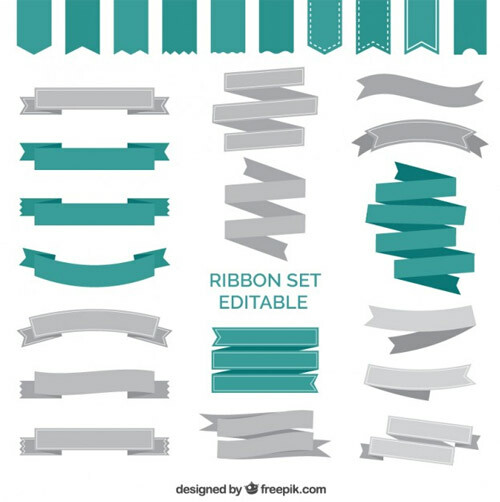 This is an editable ribbon set that contains various examples. 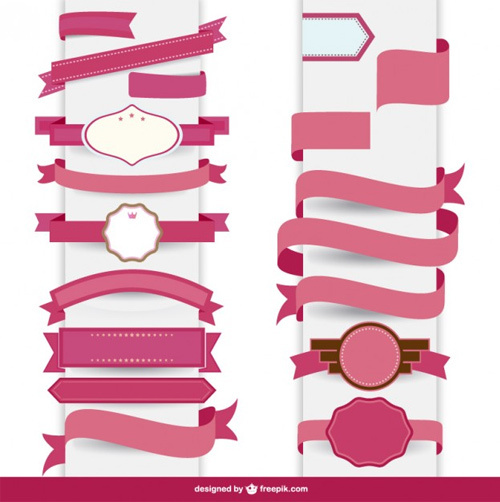 You’ll definitely find the ribbon you’ve been searching for in this template! The colors can be easily modified too. These pastel colors ribbons are really nice and will definitely make your creative project more compelling. They look friendly and so will your project if you decide to use one of these. 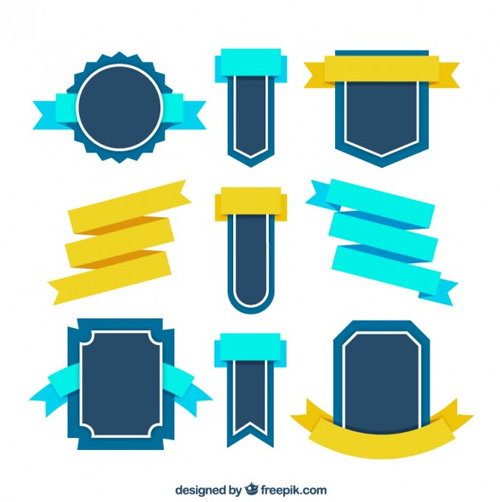 This set contains both ribbons and badges and it can come in really handy. Each one was carefully designed to look great! 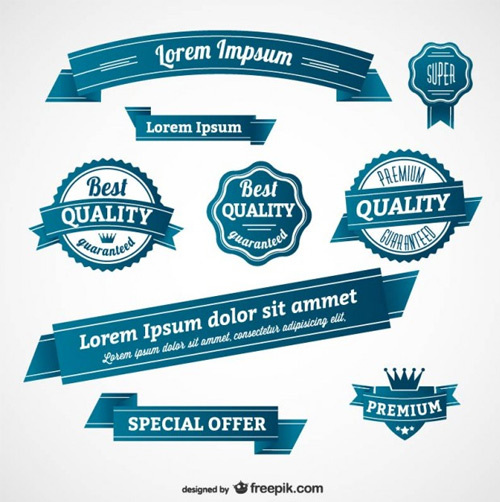 These can be used as badges as well and will display perfectly on a website’s sidebar. These pink ribbons are one of the cutest you’ll find on the internet and they’re also free. They’re perfect for feminine websites. Find your favorite! These ribbons are also great and they stand out from the previous examples thanks to their grungy texture. They have some really unique designs and you can easily add texts on top of them to turn them into call to action buttons. 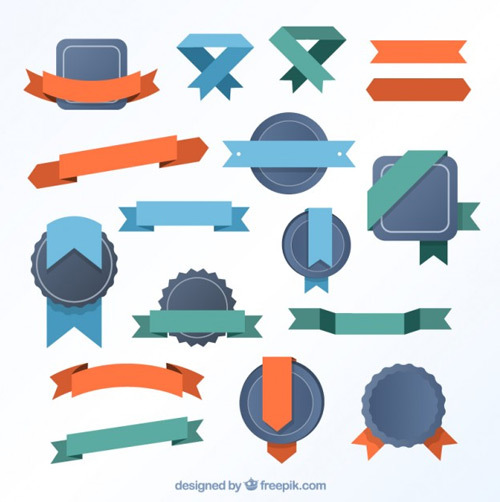 These ribbons look like they’ve been made out of paper and they’ll look nice in any 3D website project. They have subtle shadows and textures which can be easily modified. 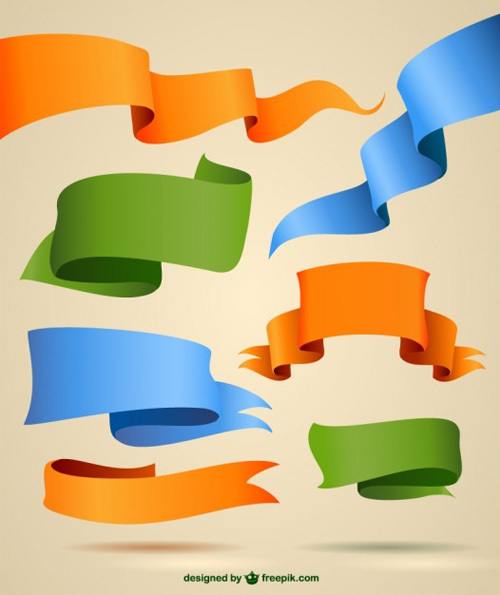 This collection of ribbons contains various and colorful examples. All you have to do is download the set and pick the one you like the most. These are some really nice retro ribbons and badges which can’t miss from a designer’s arsenal. Easily modify the texts, fonts and colors / gradients. These origami banners will definitely make your project look more compelling. 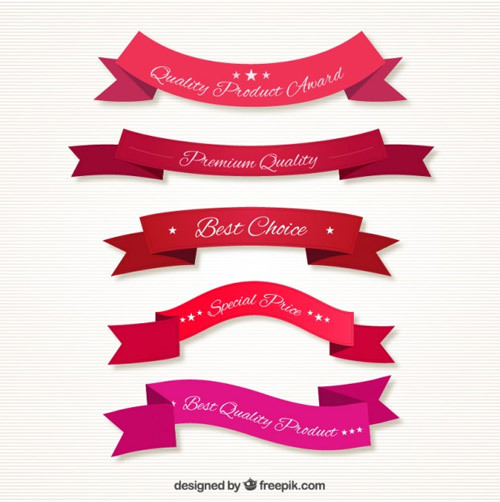 They’re nice and colorful and they’re a great asset to have in your freebies collection. 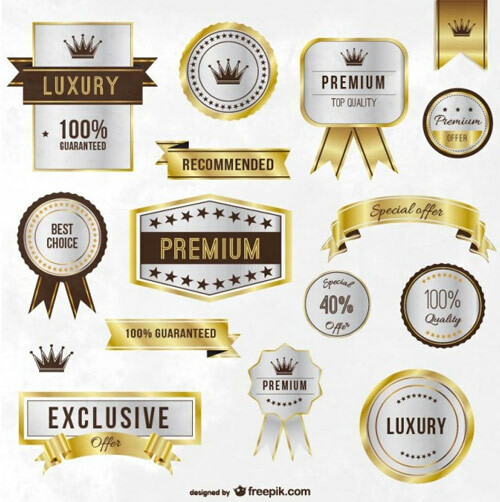 This is a nice set of premium badges which were carefully designed. 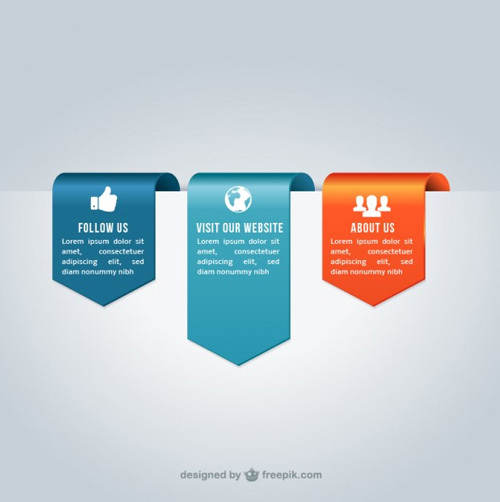 You can easily modify these to match your project’s theme and style. These luxury golden labels and ribbons are a must-have in a designer’s library. Check them out and immediately add them to your collection. If you don’t like the gold gradient, simply edit them in Adobe illustrator and change it to any other color you want. 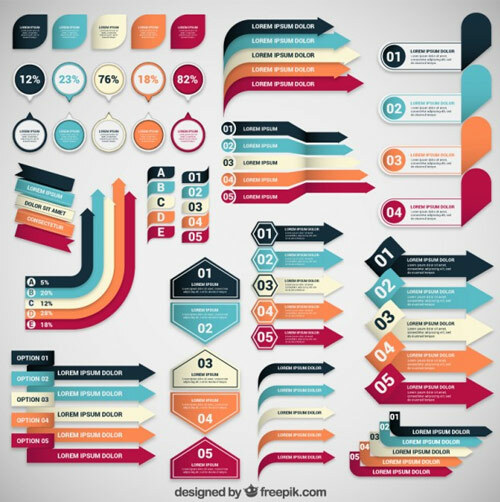 This set contains plenty of infographic banners. They come in many color variations and shapes. You’ll definitely find the one you were searching for in this set. 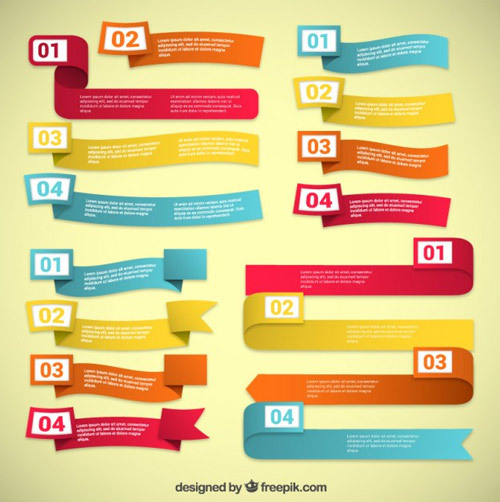 You can edit these ribbons until you get the perfect one for you and your project. They’re also really nice and will definitely look good on your project. 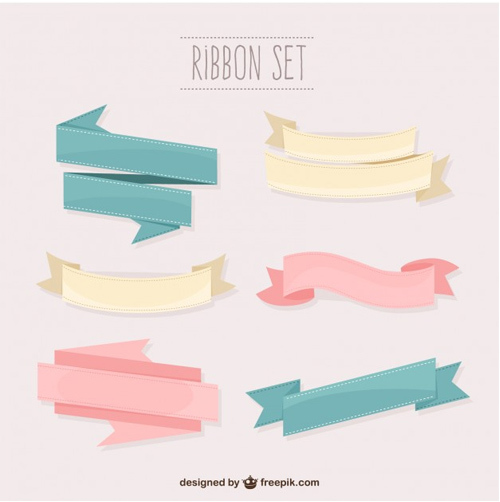 You can never have enough colorful ribbons in your collection so if you are looking to expand your arsenal make sure to check out this set as well. It contains awesome colorful ribbons. These ribbons come in red tones and look great. Use them to make your projects more eye-catching! You can also turn them flat, by modifying the gradient and applying a flat color. 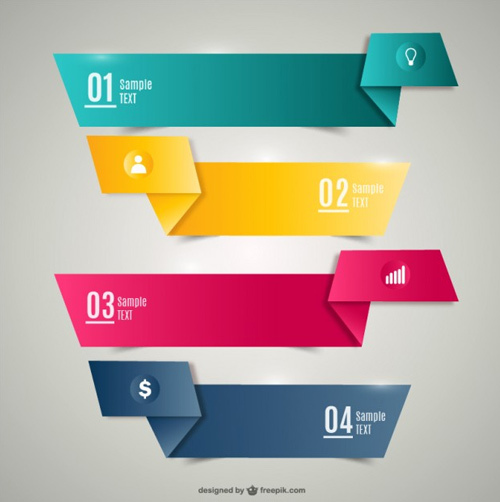 Are you working on an e-commerce project? Or on a shop-related creative project? 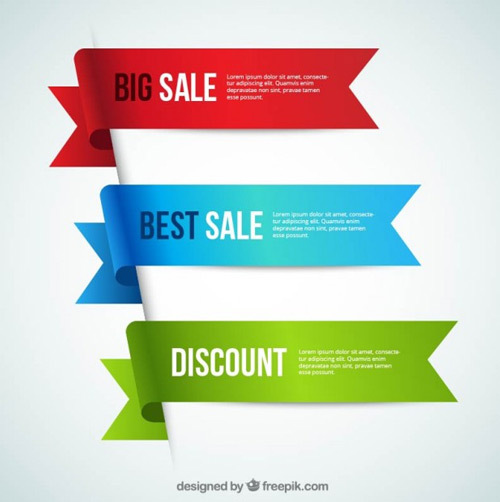 These ribbons designs may come in handy for displaying offers and promotions! 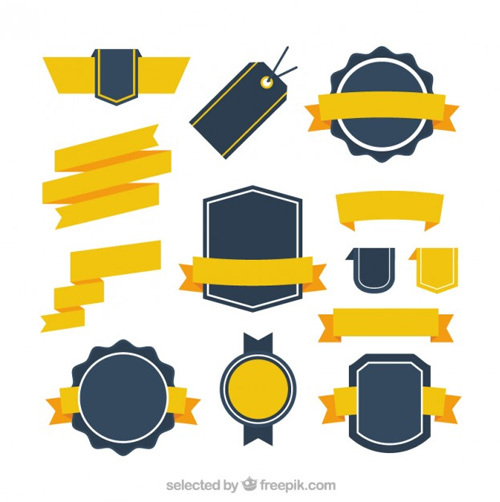 If you’ve been trying to find a really nice set of badges and ribbons and you’ve been failing then you might want to download this amazing set. It contains awesome examples. 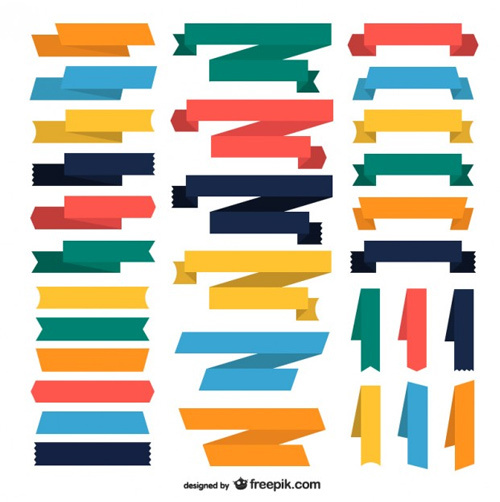 These ribbons use a joyful palette of colors and each one is different and cool in its own way. Check it out and find the ribbon you’ve been searching for all this time. 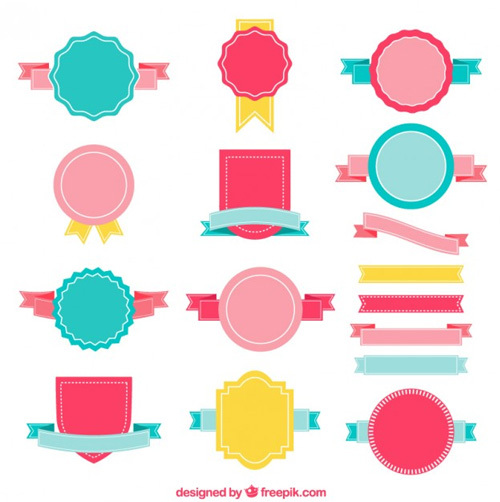 If you are looking for some badges with ribbons then you came to the right place. This set contains everything you need for your project. These ribbons have a flat and elegant design. They can definitely be integrated into all sorts of creative projects, from graphic designs to websites for online shops, and more. If you’re looking for some more ribbons and also a fan of the color turquoise then you will most likely adore this set. You can easily change the color and edit these vectors in Illustrator. This is a set of colorful decorative elements that use a really nice color palette. They look nice and playful and so will your projects if decide to use on these. 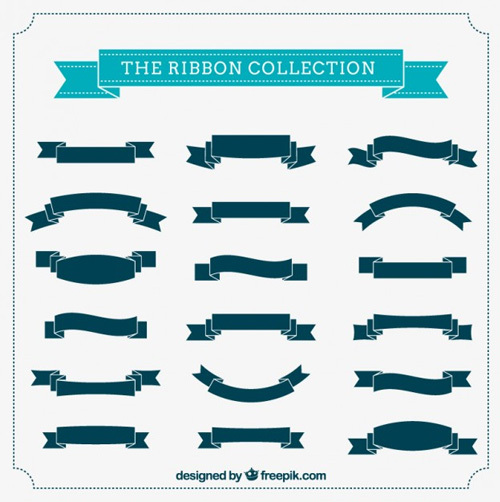 This is The Ribbon Collection. 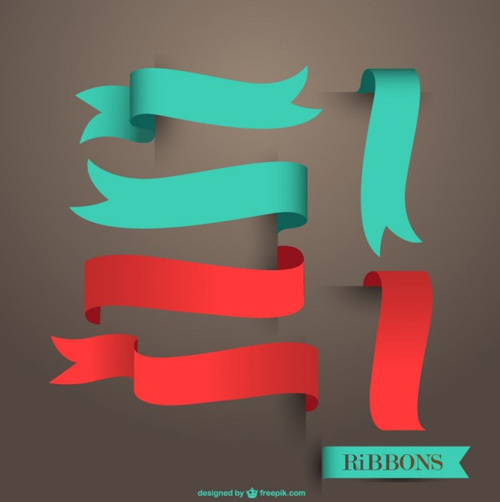 It contains various good-looking ribbons for you to use in your projects. These have a simple, flat design and come in so many different shapes. You can change the colors so they can fit your project’s color palette. 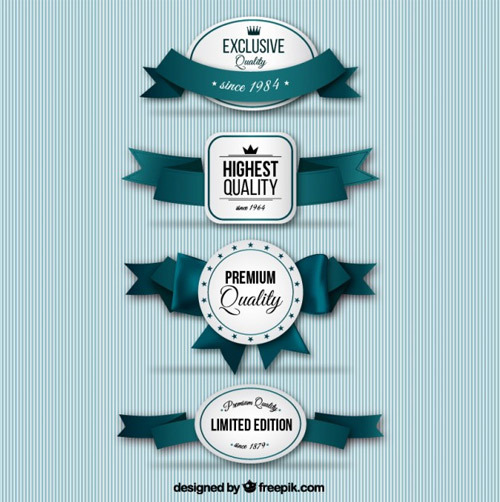 Special Price labels set are also a must-have in a designer’s collection. 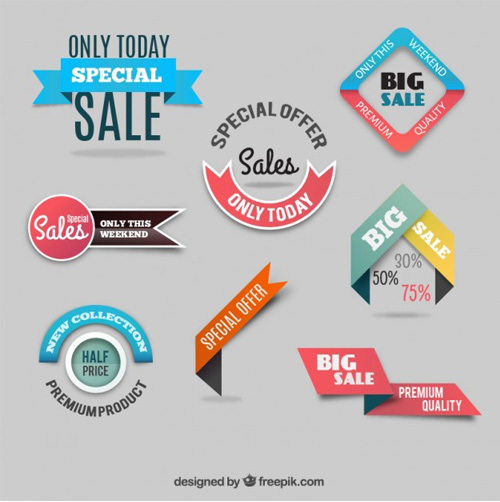 Do not miss the chance to have these colorful special offer labels! 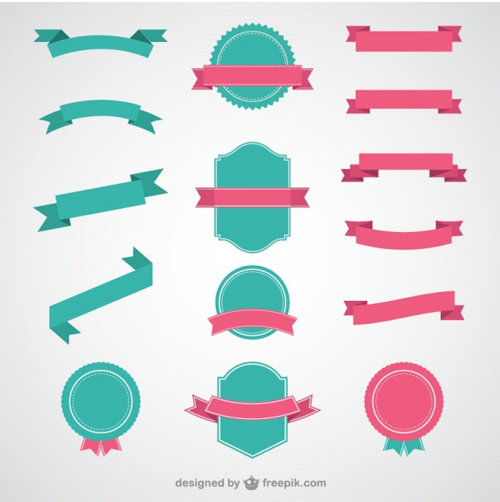 Do you want some vector ribbons to add to your collection? Check out this amazing example and feel free to try them out in your projects. These ribbons look playful and they come in various colors. They can come in really handy and you can definitely integrate them into your projects. This collection contains dark blue and yellow graphic elements. 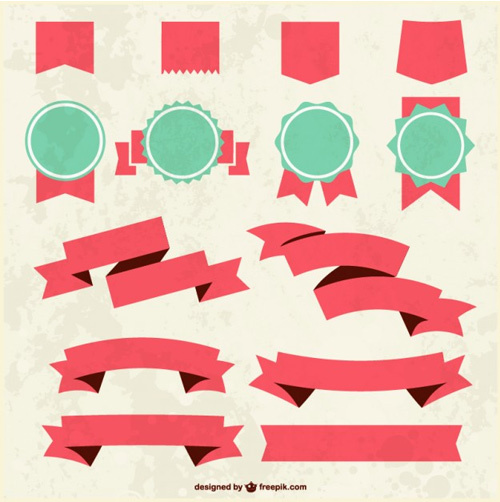 Use these ribbons and badges to make your projects more compelling. 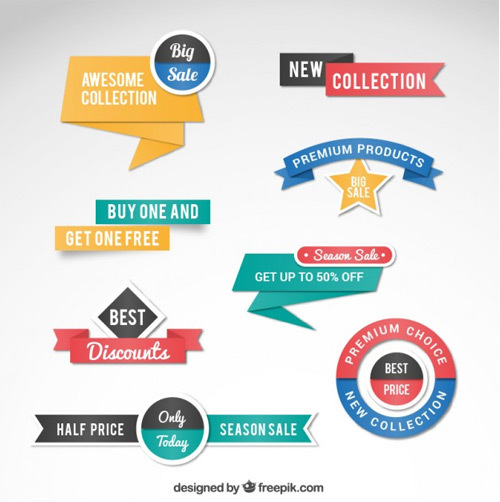 Up for some more cute discount labels? 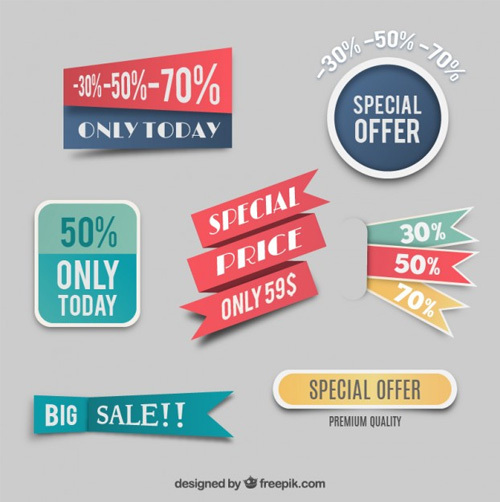 Try out this set and pick your favorite special offer label. 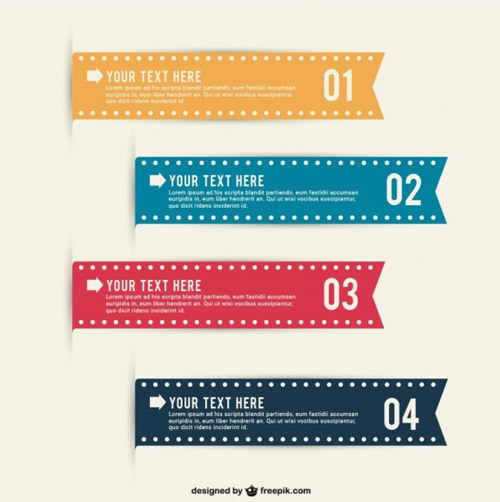 Last but not least, this is a really nice ribbon banners template which will definitely make your project or presentation stand out. Keep in mind everything from Freepik requires attribution.